If you can recall back to the far-flung month of last April, I performed some very jubilant calisthenics over Greg Motolla’s incessantly huggable Adventureland, a film I gushingly praised as being “a genuinely funny, heartfelt slice of coming-of-age narrative that sneaks up and lulls you into a blissful state of nostalgic joy”. Faint praise indeed, and my unabashed fondness for the film has only increased since. 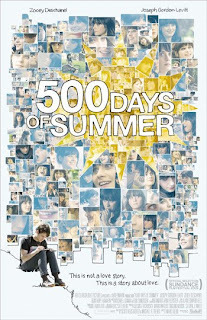 However, with the slowly expanding release of Marc Webb’s lush and tender pop-smart post-modern dramedy 500 Days of Summer, we’ve once again been lovingly presented with another brilliantly comical, and similarly-themed, exploration into the dizzying highs and soul-crushing lows of twenty-something romance. If 2008 was the year of the reinvented superhero, I hereby dub 2009 as the year of the perceptive young love story. Ostensibly assembled as an affectionate 21st century tribute to the 1977 Woody Allen classic Annie Hall, which mixed real-world relationship insights with fourth-wall-breaking snark and hilariously indulgent genre-bending absurdities, 500 Days of Summ er is like that flick’s hip little brother: still bearing the same timeless American hopes and dreams, but boasting a contemporary ironic voice and an ADD-addled brain . As opposed to the average fluff-stuffed rom-com, which typically traces a dopey-smiley couple of combative alpha personalities from first “Meet-Cute” to “Stupid Misunderstanding” to the inevitable “Climactic Slow-Mo Make-Up Smooch”, Webb’s artfully constructed slice of whimsy bounces wildly around the timeline of its central duo’s romantic cycle, honing in the small intimate moments of truth crammed neatly between the colossal defining events. This is a film more focussed on the emotions of the morning after than the steamy passions of the carnal act itself. And what an unforgettable post-coital sunrise it is, as greeting card writer Tom Hanson, played by the destined-for-big-things Joseph Gordon-Levitt, bursting with joyful triumph, merrily shakes hands with a throng of complete strangers before breaking into an infectiously winning impromptu-yet-choreographed dance routine to Hall & Oates’ “You Make My Dreams Come True”. Yep, he’s in love, all right. Who’s the lucky girl? That would be the free-spirited Summer Finn (Zooey Deschanel), a spritely bundle of modern-woman philosophies and quirky, odd-ball tastes (Ringo is her fave Beatle! She collects eccentric bric-a-brac! Gadzooks!). How did they meet? I’m so glad you asked. Really. You see, she’s a recent hire at Tom’s company, working for his affable boss Vance (a kindly Clark Gregg). Sure, he thinks she’s out of his league, and tries to avoid her at first, but, after a drunken office karaoke party, things begin to click and sparks ignite. So what’s the problem, then? Well, Summer isn’t interested in a commitment while Tom has been indoctrinated from childhood to yearn for exactly that. Uh oh. As the film jumps around we begin to see cracks appear in their union: He’s overly determined and needy, while she’s distant and masking deep-rooted unhappiness. Can a solution be found? The film’s poster informs us that “This is not a love story. This is a story about love.”, and certainly a more apt description cannot exist. 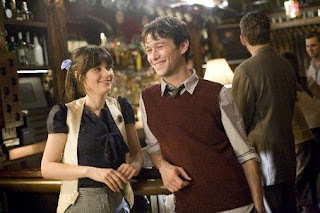 500 Days of Summer uncovers the truth behind sweeping romance, and packs it with broadly painted eye-candy and quiet, naked observations, big laughs and contemplative solemnity. Director Webb and screenwriters Scott Neustadter and Michael H. Weber have ingeniously crafted a narrowly focussed character study that is, at the same time, eerily identifiable to almost everyone in the audience. As fun as the film’s script is, and how much energy Webb brings to the classy affair, all would be nought if, um, not for the lively performances from its two central actors. Gordon-Levitt, an intriguing talent on the rise for some time now (Go rent Brick an d The Lookout and see the early warning signs) is an ideal love-sick man-boy, charismatic and charming, but also not afraid to reveal the insecurity within. He’s able to play petulant frustration extremely well, as in an office meeting blow-up where all his romantic aggravation comes to an explosive head, and yet he still has the light touch to grab the film’s witty comic dialogue and situations and run with them. Zooey Deschanel’s role is trickier. As Summer is, at least in sunnier times, Tom’s idea of flawlessness, she has to essentially play an almost angelic girl whose imperfections are all but ignored in favour of the fantasized ideal. Fortunately, no actress does idiosyncratic adorability better and, having finally found a director capable of harnessing her high-voltage magnetic appeal, she’s so sunny, funny and gorgeous that I’d suggest that any hot-blooded male who walks out the film not in love with her is either a soulless android or a corpse. When her character enters darker territory in the latter half, the actress is restrained and wounded – ixnaying the stereotypical screeching, erratic harpy routine in favour of something more touching and honest. Just as Tom can’t get Summer out of his head, 500 Days of Summer succeeds in making sure we can’t get Deschanel out of ours. Although not all of the film’s flights of fancy strike gold – there’s a foreign film montage that feels too arch and superfluous and Tom ’s wise-behind-her-years Juno-like little sister, who speaks like a brainy 39-year-old screenwriter, is a tad grating and inconsistent with the identifiable humanity of the rest of the cast. Helping to counter-balance these weaknesses are a spell-binding split-screen scene, which details an event from both Tom’s hopeful pre-visualized expectations and the heart-breakingly brutal reality, the aforementioned dance sequence and, quite possibly, the greatest Han Solo reference of all time. The film’s structure mirrors the emotional freefall of young romance, with the early encounters crackling with the electric excitement of discovery and unspoken desire and the later scenes shadowed by barely-suppressed sorrow and an uncomfortable fear of the unavoidable. Like Adventureland, and Annie Hall of course, it’s a cinematic journey that feels alive and in the moment, a snapshot of a scenario that we almost regret to admit looks vaguely familiar. 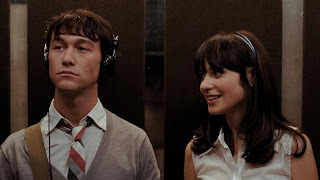 500 Days of Summer won’t change the face of cinema, or make Transformers dollars, but it will make you laugh, grin ear-to-ear and maybe, just maybe, even lead you to re-evaluate and come to terms with your own particularly traumatic ill-fated romances. Who ever said that cinematic love couldn’t be grand? Cam Returns To The Hype! Cast!